$2/2 Greeting Cards = 2 FREE! $2/2 Greeting Cards (no exclusions!) 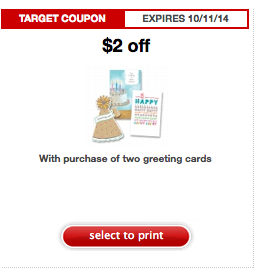 - use this Target coupon at Target or as a competitor coupon at Price Chopper to score 2 Free $0.99 priced cards!